Rick, a reader of our Integrity Moments, had been working with a ministry leader who did something illegal and asked him to follow suit. When Rick refused, he was fired. Rick says our daily newsletter came into his life at that point to heal his heart. 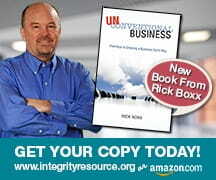 Day by day Integrity Moments assured Rick that doing the right thing was more important than his circumstances. If you ever wonder why I have written Integrity Moments daily for so many years, it’s because of the encouragement it brings to people like Rick.